What’s the Story Behind a Painting? In the Broadway hit “Sunday in the Park with George”, Stephen Sondheim and James Lapine captured the essence of Georges Seurat’s painting “A Sunday Afternoon on the Island of La Grande Jatte”by telling a story behind the painting. When you look at the canvas, filled with dots and color that create light, it’s not hard to think about the lives of the people wandering around the lake transfixed by the beauty of a summer day. In 2012, author Tracy Chevalier gave a TedTalk about her fascination with the story behind the Vermeer painting, “Girl with the Pearl Earring”. Much like an investigator, she took various elements of the painting – the texture of her clothes, the look in her eyes, the parting of her mouth, the scant history of Veneer himself – and began to develop a sensual story that became her novel of the same name. Paintings, and what a view extracts from them, can maketh the storyteller. It’s a great form of inspiration that can ignite the imagination. Go to a museum or search artwork on the internet, and let your mind flow. Chevalier’s TedTalk is here in the link above. Categories: Uncategorized | Tags: Storytelling, The Girl with the Pearl Earring, Vermeer, Writing | Permalink. 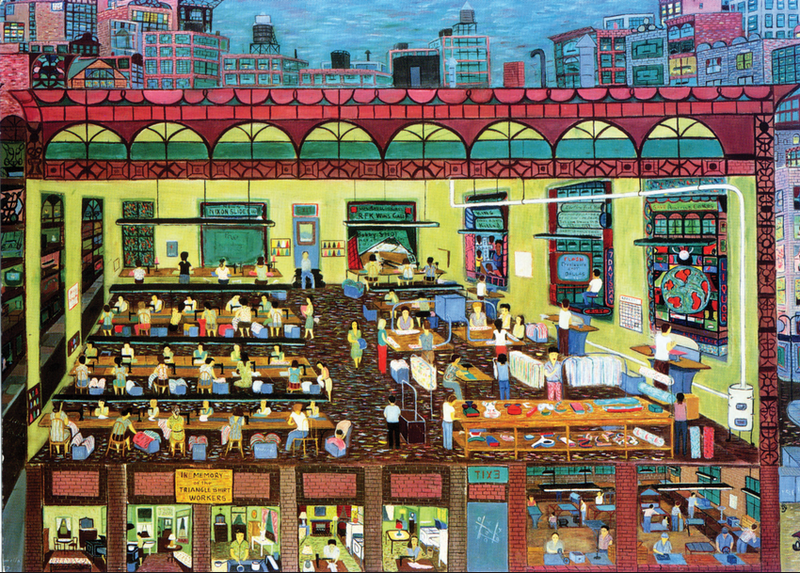 Ralph Fasanella (1914 – 1997) was a self taught American artist whose creations depicted the struggles, strife and triumph of the working class. Born in Bronx, NY to Italian immigrant parents, Fasanella’s political activism was harvested by his mother – who took him to union meetings instilling a strong connection to labor workers and ant-Facist causes. During the Depression, Fasanella found employment as a textile worker and a truck driver. Sensitive to the plight and committed to the rights of the hard working class, he volunteered to fight in the Spanish Civil War, and returned to the U.S. after the conflict to organize labor unions. It wasn’t until he developed arthritis in his hands when a union colleague suggested he try painting to ease the pain. This is where his art life began. Fasanella paintings have the purity of color and structure, depicting the lives of everyday hard working people. An painting on Yankee Stadium is colorized and enlivened with every ounce of human kind and commercial atmosphere. Not a space is wasted as humanity is illustrated – the story of a day in the ballpark – mid-century – forever painted on canvas. Think of the lives each painted character represents, their history and their day at the park. Where the Yankees winning? Did Mickey drive home a run to win the game? Your imagination runs wild with possibilities. Take the painting that is the header of this blog. It shows a landscape of a bustling city. The bridges over the East River and beyond to the skyscrapers giving way to green pastures of the suburbs in the distance – the suburb where Fasanella settled down to raise children late in his life. Far away from the rattling ice trucks and the pumping iron of everyday life. Far away from woefully dangerous pre-labor forced laws that came too late for the women of the Triangle Waistshirt Factory depicted during an ordinary day in the painting above – before the catastrophic fire that forced new safety laws for workers in this country. Fasanella was a storyteller in painting. The colors created the words. The brushstrokes enlivened people long lost in the passage of time, their memories and minds lost forever, yet brought forth in brushstrokes controlled by a man who knew their struggle. For more on Ralph Fasanella – please check out the American Smithsonian Art Museum’s retrospect of the man and his work entitled “Lest We Forget”. Categories: The Good Write | Tags: Art, Ralph Fasanella, Storytelling | Permalink.